This summer, I’m studying the evolution of the Haggadah with Rabbi Reuven Cohn through a Hebrew College Online course. In coming to understand some of the choices made in the development of the Hagaddah, we have journeyed through several different sections of the Talmud, getting to know some of the players who pop up in our seder. Tonight, I studied Brachot 27b – 28a, which relates the story of the impeachment of Rabban Gamliel from his post as Rosh Yeshiva (head of the Jewish learning institution). There’s an incredible influx of students to the yeshiva once this entrance requirement is loosened – the sages tell us that more seats needed to be installed to accommodate all the new students. The Talmud records a debate of whether there were 400 or 700 new students. 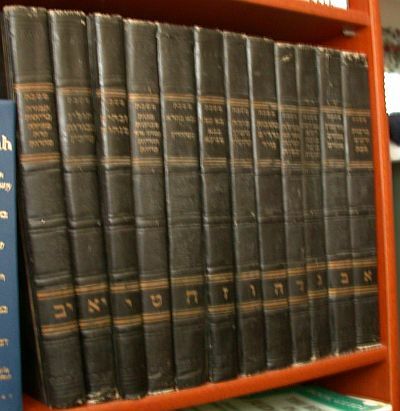 The Talmud also notes that in the first day of learning under new leadership, the entire slate of halachic disputes to be discussed is resolved — learning in the new atmosphere is more productive. What if, heaven forbid, I kept the Torah from Israel? Powerful stuff, no? This is the preeminent Rabbi of his generation wondering if his insular approach to Jewish learning and Jewish community put up a roadblock between the Torah and the Jewish people. To drive the point home, the Talmud goes on to relate the story of Judah the Ammonite, a ger (“resident alien” – a non-Israelite, non-idolater living within Israelite community) who wishes to marry a Jewish woman (and thereby “enter the congregation” – i.e., become a Jew). You may recall that the Ammonites and Moabites are forbidden from marrying Jews way back in Deuteronomy 23:3. Long story short, Gamliel loses the argument and Judah is admitted. The Talmud privileges opening the community to those who seek to learn over a Biblical prohibition. There’s a lot of reasoning about why this prohibition doesn’t apply any more – I don’t mean to oversimplify. But the overwhelming message to this entire section is clear. Don’t keep the Torah from Israel. Don’t define “Israel” so narrowly that you inadvertently keep the Torah from Israel, either. Don’t let one authority silence the debate and discussion in the study house that will open access to the Torah for so many more.